medical plants (Clerodendrum thomsonae Balff.) are usually grown as an ornamental plant in the yard or in the park, and can be found up to an altitude of 1000 m above sea level. Originally from tropical Africa, can grow in pots or in soil, such as the location of a slightly sheltered or exposed to full sunlight for good flowering. 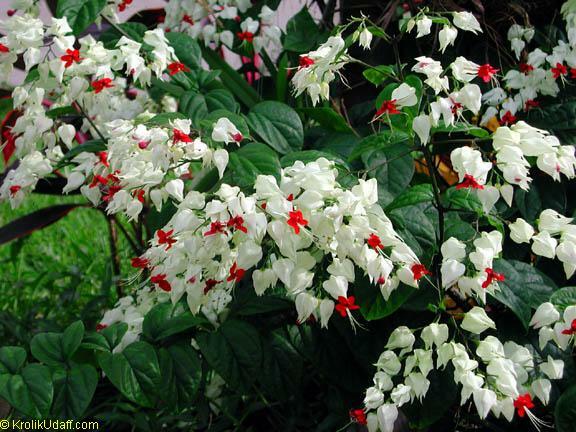 Climbing shrubs or vines, 2-5 m high Young twigs of this plant has a rectangular shape. Single leaf, stemmed, elongated oval shape, sharp edges, flat edge. Flowers out of the tip of the fruit twigs or leaves the armpit, in the circuit rasemos, berseludang red color is yellowish white, with round green seeds 2-4, dark brown color when ripe. Propagation by seed, cuttings or root solving. Clears heat and toxins (toxins).